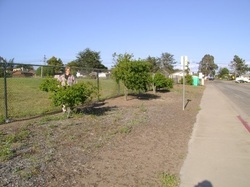 Students, parents, teachers, and Lionel collaborated in the fall of 2003 to plant the schools barren fence line with live oaks, which have now grown tall. In the fall of 2007, Lionel returned to the site and planted five island oaks in the parking lot dividers. Since the project began, the school has initiated a dunes restoration project on its grounds, as well as planted nearly two dozen more oaks grown from acorns collected nearby by students and parents. OCE is currently planning to landscape the parking lot with low-maintenance, drought tolerant natives, simultaneously educating students and parents about the appropriate landscaping.